Ric W. Horner has concentrated on producing timeless contemporary land- and seascapes since graduating from Exeter College of Design in 1989. In his early work he developed a profound engagement with the challenges and opportunities of representing distance and light, and this engagement has subsequently remained at the heart of his work. For the last seventeen years, he has been based in Whitstable, Kent, which he has known since childhood and where he continues to explore in paint the light and effects of views of the North Kent coast. From an interview in 2018. Why do you paint the sea? As I grew up by the sea, it was the first thing that I noticed that was different to everything else – a local feature in Cliftonville – constantly changing, the tide going in and out, revealing and hiding things. As I child I found this fascinating and even dreamt about it. In a wider sense, we are a nation surrounded by water, so it inevitably feeds into our consciousness. What led you into painting the sea? What interests you most about seascapes? Well I suppose that first answer answered it. It transpired that the main thing I was good at at school was painting pictures. So teachers encouraged this so I probably got better at it. I have 2 older brothers. As children we used to do a lot of beach combing, so there was a group enthusiasm about it. There were some explosives washed up from war ship wrecks. The second world war was a fascination for us – all 3 of us were interested by this environment that was so close to us. It was good to spend time with my brothers. There were caves and tunnels in the cliffs, originally for smuggling and used latterly in war time. There is architecture by the sea that slowly gets degraded. There is a transition from finished thing to decay. The way the sea degrades things is quite beautiful. Ultimately, it became the place were a lot of happy memories of childhood existed so it has always been a positive thing in my mind, which is fed into painting it. The optimism of that time. There were chalk cliffs where I grew up; the blue shadows in the white chalk cliffs were very uplifting. From the age of 3 or 4, I used to ask my mother to go to the beach so I could look at them. 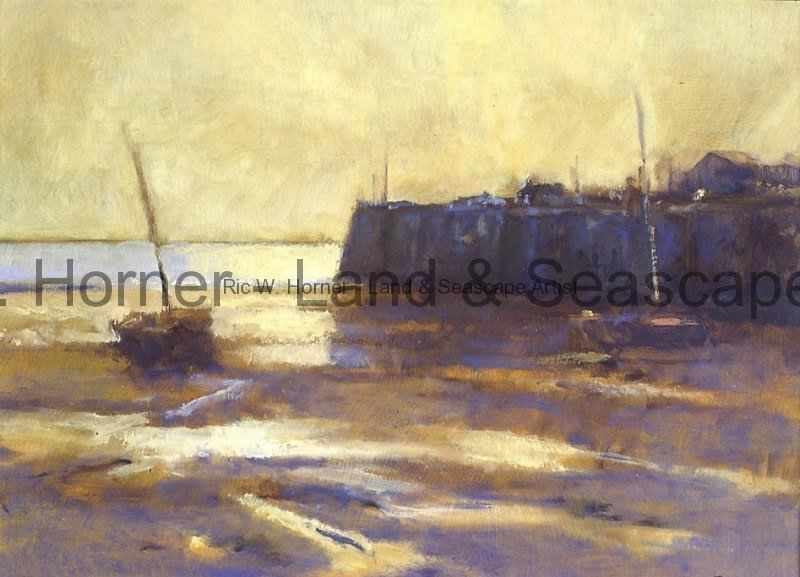 What do you try to capture when painting seascapes? The key factor is the light. It is worth pointing out that the sea effectively wants to be a mirror, by the actions of the weather, it is not a perfect reflection of what is above it. This creates a subject that is more dynamic, creating an infinite variety of visual effects that are extremely challenging to paint. I work regularly on the idea of the unseen and the familiar, finding detail and information where superficially you don’t see it. If as a painter, your work is about nature, you have to look harder than everybody else. A seascape can be an empty space, but it is full. I like playing with this with my work – empty spaces are as busy as full ones. The light is also a metaphor for a more poetic interpretation, it is not just an optical effect. Elements can be exaggerated or diminished according to mood and poetic intention. The Impressionists, Turner, Gainsborough, Munch and Matthew Alexander, a local artist who was my art teacher at school and is a member of the Royal Academy of Art and was a great inspiration for me. He taught me how to see colour. What media do you use? Why? My primary medium is oil paint; it has the greatest flexibility of all painting media, but I still enjoy drawing. Charcoal is a great material for quick impressions of the subject that I want to paint. Gouache, I quite enjoy using that – it’s like water based oil paint but it is very matt, and there is a limit as to how much you can put on paper. My favourite is oil paint as it is more enduring and a convincing illusion of light can be constructed with it. What else are you interested in painting? 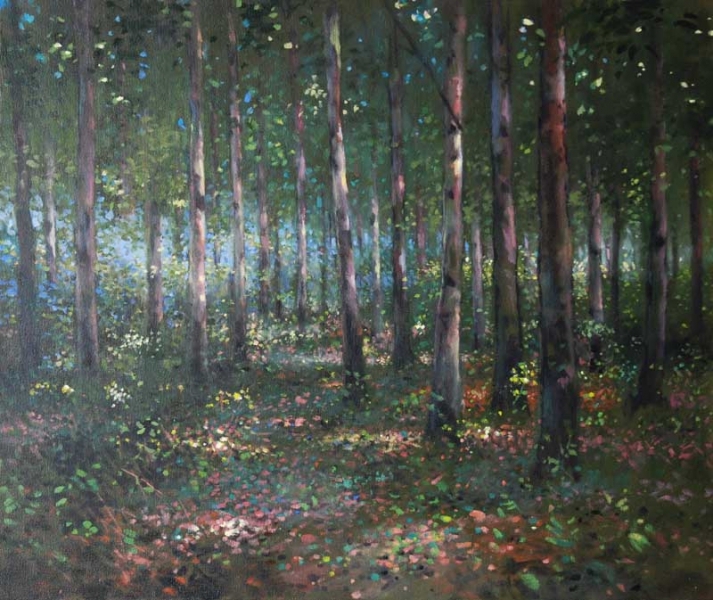 I also paint other subjects, I’m particularly fond of woodland and semi-urban environments but often use the reflective nature of water as it provides maximum contrast in terms of light, dark and texture. I like finding pockets of beauty where you least expect it, which is particular true in urban landscapes. Observed truth and poetic truth – a painting exists somewhere between the two. It is down to the artist to realise that.